Vincenzo Nibali dominated the Tour de France in 2014, riding into the yellow jersey with victory on stage two, and relinquishing it for only a single stage en-route to the top step of the podium in Paris. 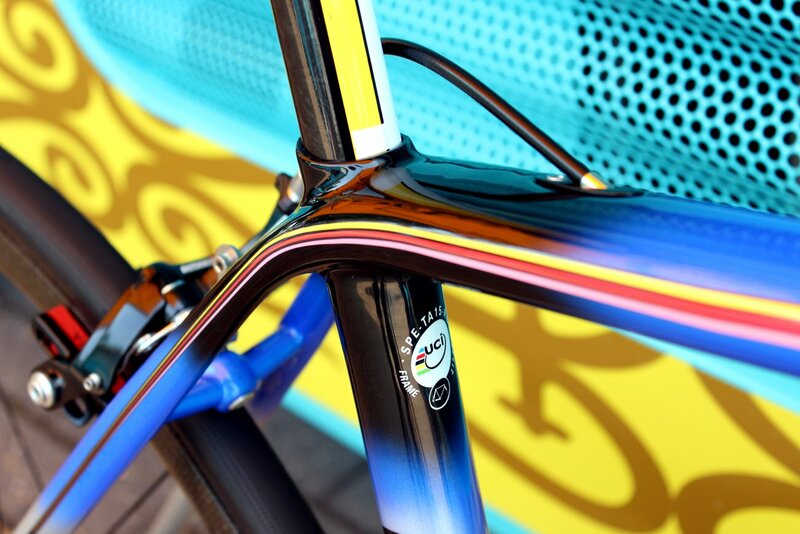 Nibali is riding this custom Specialized S-Works Tarmac as he seeks to defend his title in this year's race. Nibali is in elite company as one of cycling's great champions, with Alberto Contador, Jacques Anquetil, Felice Gimondi, Bernard Hinault and Eddy Merckx the only other riders to have triumphed at the Tour, Giro and Vuelta. 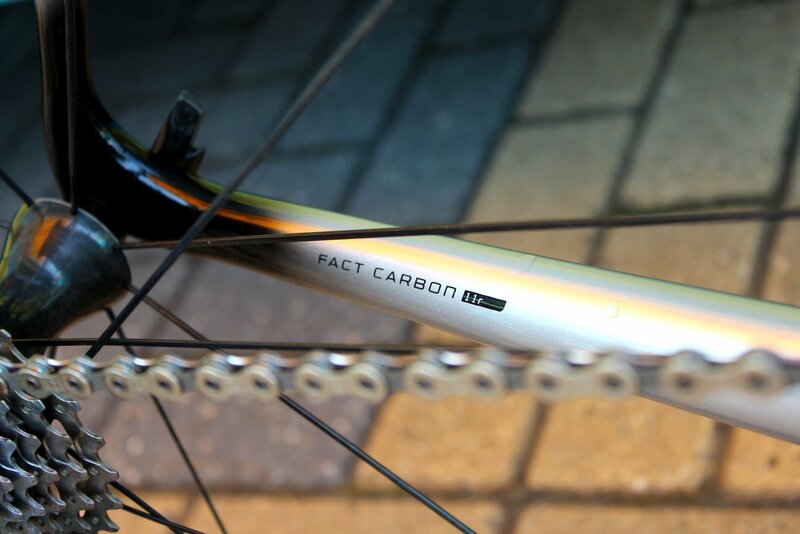 The intricate detail continues on to the seattube and seatstays. It is a superb-looking machine - even better in the flesh - and a bike fit for a champion. Nibali's Astana team are sponsored by FSA and the Italian firm produced a range of Nibali-inspired 'Tour de France special edition' components off the back of the 30-year-old's win. 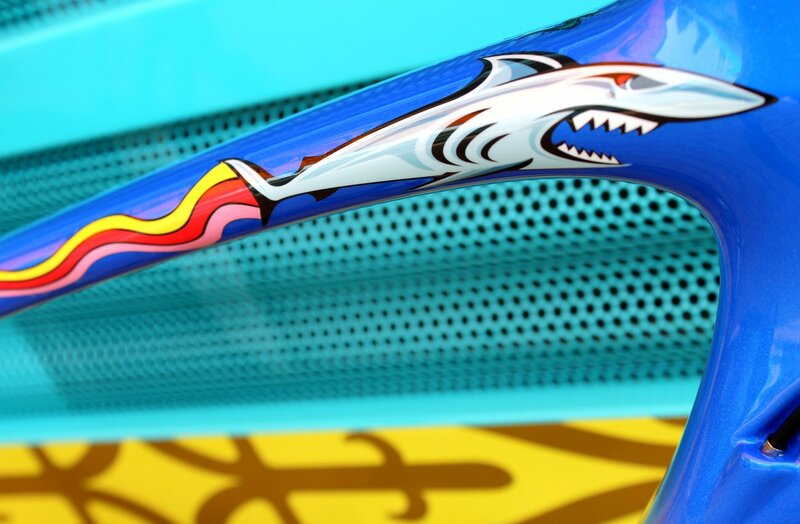 Needless to say, those components, which feature Nibali's shark logo with a yellow, pink and red fin, as well as plenty of yellow elsewhere, take pride of place on his 2015 Tour bike. Visibility is everything to sponsors, who rely on media coverage to extract value from any deal they sign with a team or rider. 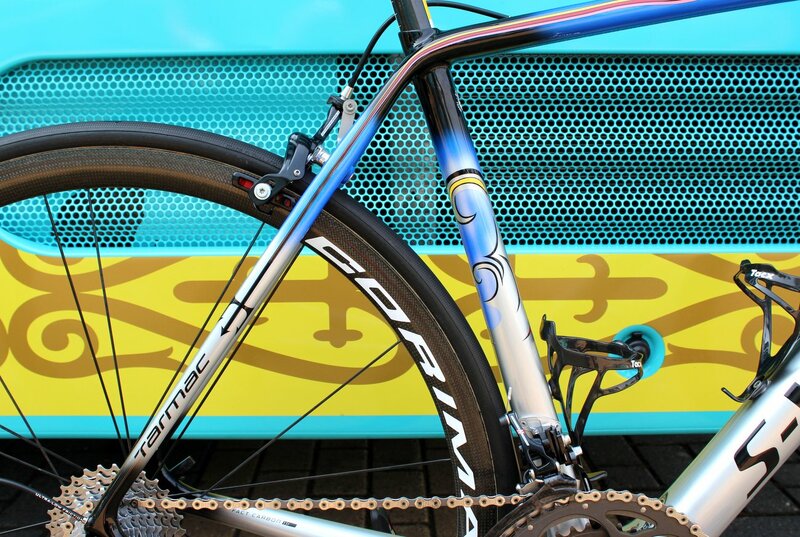 FSA take that one step further, however, by demanding that stickers be placed on top of the handlebar tape on Astana bikes. 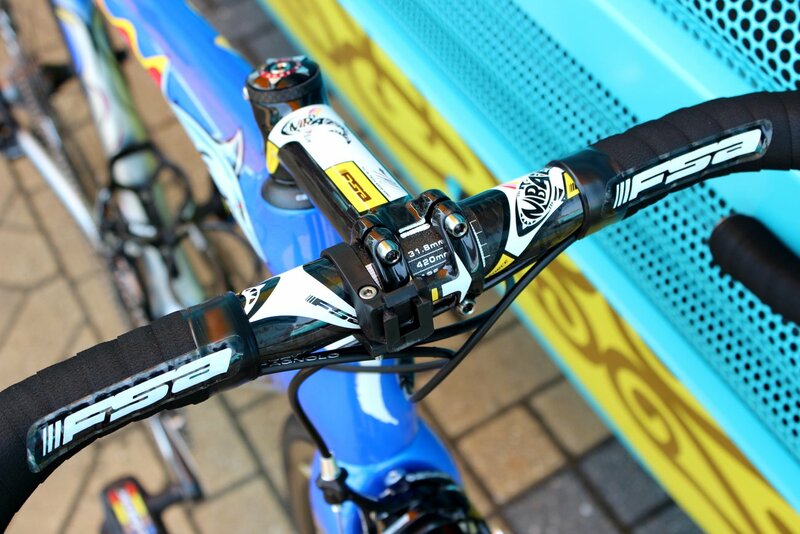 Nibali, if you were wandering, uses a 42cm -wide, kevlar-reinforced FSA K-Force Compact handlebar, which has a 125mm drop and 80mm reach. 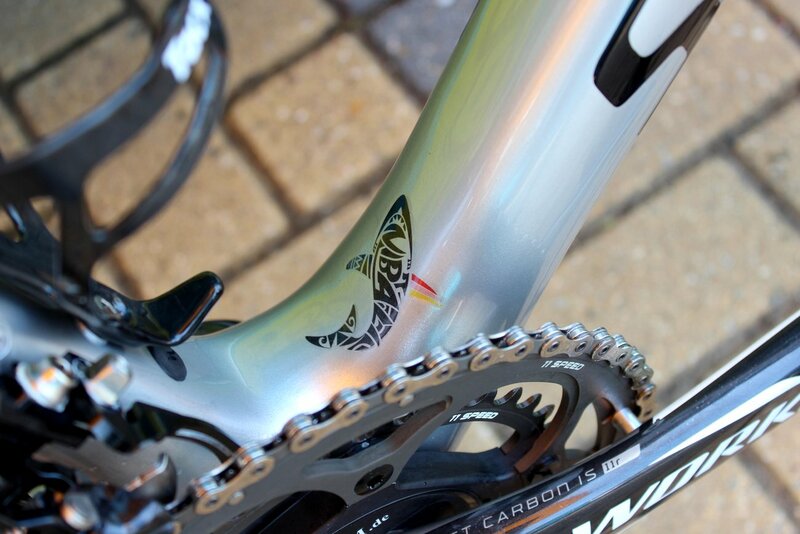 The shark theme continues on the bottom bracket. Nibali will be forced to attack in the mountains if he is to retain his Tour de France title having lost time on stage two, when crosswinds wreaked havoc in the Netherlands. This latest version of the S-Works Tarmac was unveiled ahead of the 2014 Giro d'Italia and is made from Specialized's top-of-the-range FACT 11r carbon fibre. 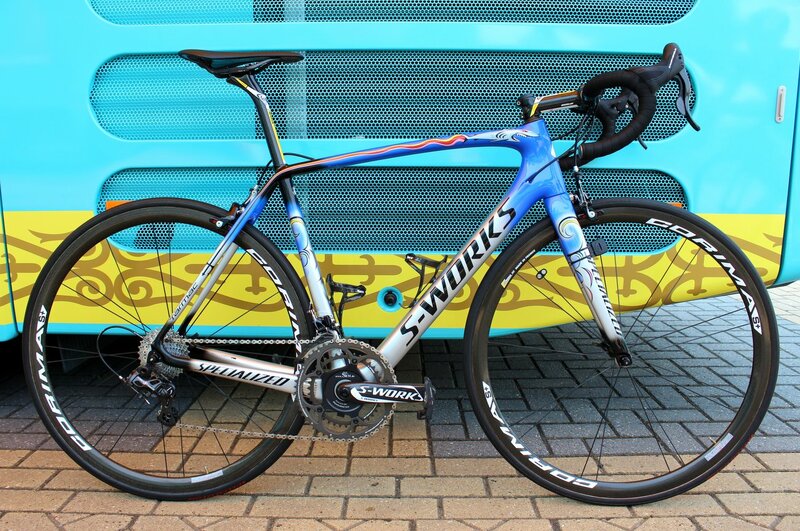 Needless to say, it's a blend which Specialized say makes the S-Works Tarmac stiffer than its predecessor. Campagnolo provide Astana's groupset components, with Nibali's machine decked out in a Super Record kit, save for the Specialized S-Works carbon crankset. It also worth pointing out that Nibali prefers to use a mechanical groupset, whereas the majority of Campagnolo-sponsored riders opt for the electronic Super Record EPS setup. 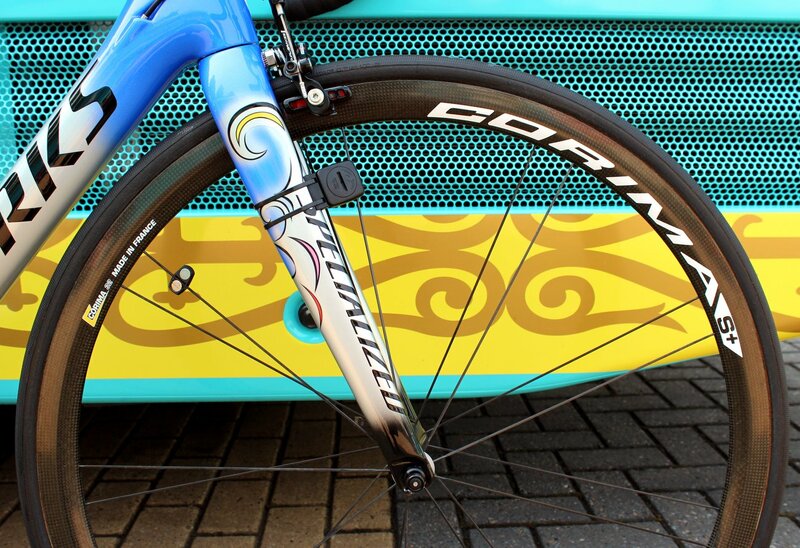 The wheels come from French brand Corima, with Nibali's bike pictured here with the super-light 32 S+ hoops. They weigh a scant 1,130g. 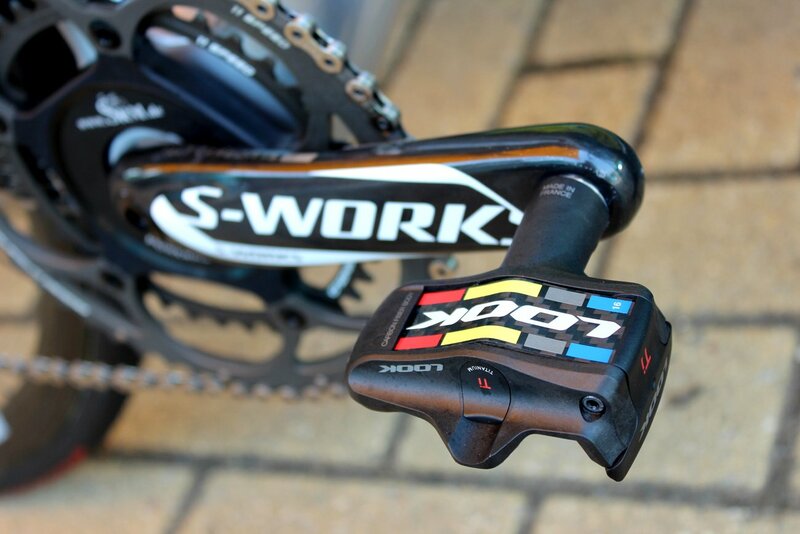 You'll typically find that pro riders use either LOOK or Shimano pedals. 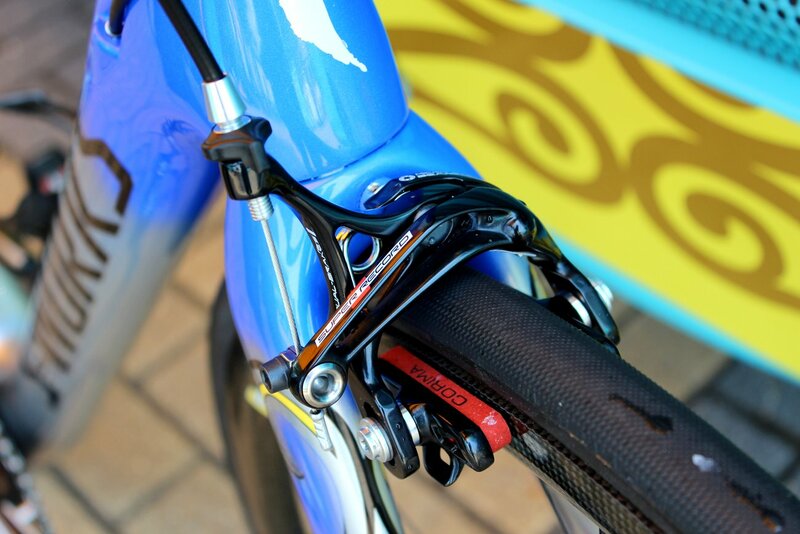 Nibali is a LOOK man and uses the aero-profiled Blade 2 pedals. 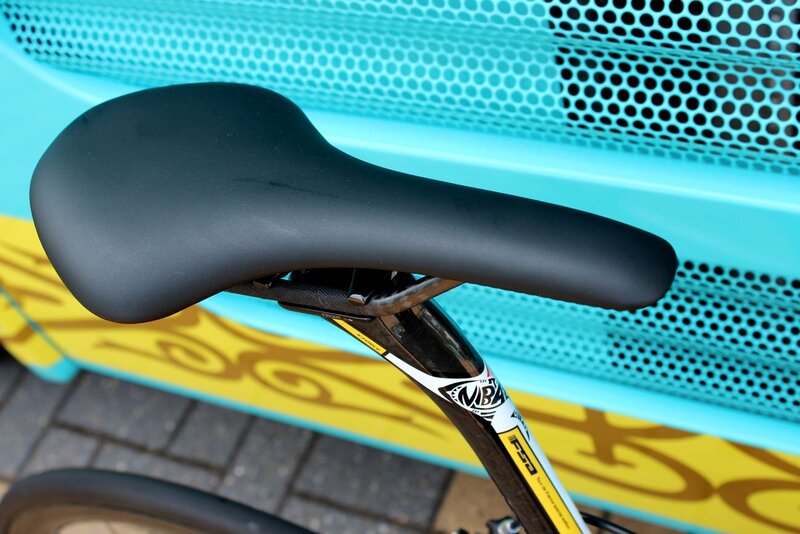 With Astana's saddles also supplied by Specialized, Nibali's preference for a Fizik Antares perch means his saddle is free from any distinguishing logos. 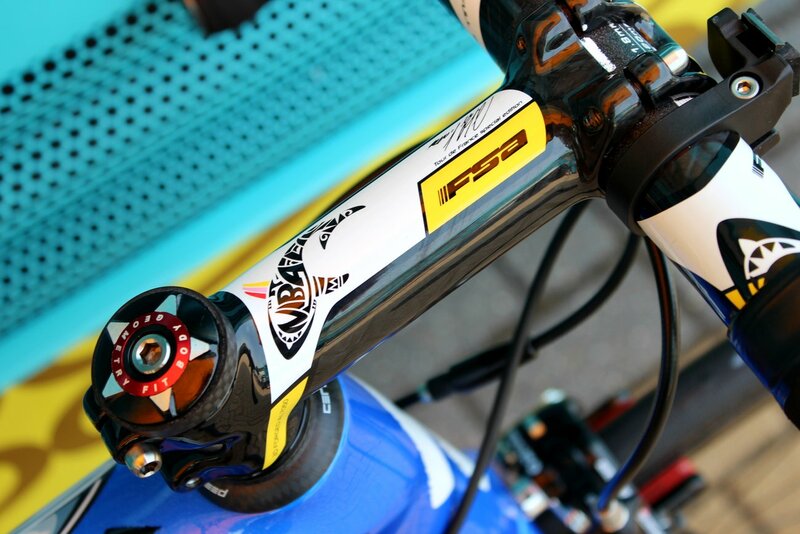 You can also see the detailing on the Nibali edition FSA seatpost. Neues Rennen, neues Rad, neues Glück? Etwa ein Jahr ist vergangen seit Vincenzo Nibali bei der Tour de France zum Sieg fuhr. Für das diesjährige Rennen bekam er vom Sponsor Specialized ein extra angefertigtes Rad, das seine Persönlichkeit und seine Erfolge gleichermaßen wiederspiegelt. Letztes Jahr zeigte Vincenzo Nibali der Welt wie man stilsicher und souverän die Tour de France gewinnt. Ab der zweiten Etappe holte er sich das gelbe Trikot und gab es auf dem Weg nach Paris nur noch einaml für einen Tag ab. Schon während der Tour fuhr er ein sehr edles Specialized Tarmac. Da überrascht es uns nicht, dass der Titelverteidiger auch in diesem Jahr das Rennen mit einem ausgefallenem Rad bestritt. Nibali, Spitzname: Hai von Messina, fährt mit seinem Specialized Tarmac einen wahren Hingucker. Die Lackierung des Rades spiegelt sowohl seine Erfolge als auch seinen Spitznamen wieder. Letztes Jahr schmückte ein angsteinflößender Hai den Steuerkopf seines Renners. Dieses Jahr haben Specialized noch einen drauf gesetzt: Der Hai ist mit seinen Details und der Ausführung ein regelrechtes Kunstwerk. Nibali ist einer unter wenigen: Nur fünf andere Fahrer haben es jemals geschafft, die drei World-Tours zu gewinnen. Auch das soll in seinem Fahrrad zu Ehren kommen. Wir haben uns das Rad mal etwas genauer angeschaut.